Hello guys! 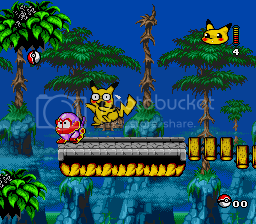 This time I tackle yet another Pokémon Bootleg game, this time for the Sega Genesis, simply called Pocket Monster II. This is a sequel of Pocket Monster released also for the Genesis. You travel through 4 stages + a final boss (Koffing). The game itself is kinda fun but it has some inconveniences with the controls, I'll explain some of them later in the submission. The big and only difference in this game in terms of difficulty, it's how many hits you can take. On Hard you die on 2 hits, on Normal by 4 and easy more than that. This game's glitches are based more on taking damage than anything else, and without getting hit a lot, I'm unable to do many tricks and shorcuts shown in the movie. So I've got to pick easy instead of hard to do more damage abuse. Bounce cancel: I can cancel my vertical boost on jumping on enemies by pressing B when I have pokeballs. Straight timed jumps: This game has the issue of being able to not jump while standing still... sorta. You can adjust your straight jumps by holding the C button and land on the ground early. Airjumping: This is why I chose easy and it is the most broken thing about the game. When on jumping on enemies or while getting hit, I can jump once again in the air. This is useful to perform amazing shortcuts and get in upper sections of a level slightly faster. I found out that you can get up the stage even faster by timing my jump when the glitch-colored monkey is still on the platform, then I airjump by taking damage and I get into the platform faster than the WR. The WR waits a few frames to hit the bird enemy, I don't. This triggers Butterfree some frames earlier and then I can jump on it and airjump later. The only notable improvement here is that I bounce cancel Electrode in the last section of the level and fall off early. The WR is able to avoid spawning Electrode, but if falls straight and it zips in a cool way. The funny thing is that the zip is slower due to falling off vertically and not diagonally and it's slower that way. I discovered 2 shortcuts in the stage that let me go to the upper sections considerably faster, by more airjumping, damage boosting and clip through specific parts of the platforms. The strategy of this guy is to hit his hitbox when he spawns in a specific event. His hixbox is VERY weird though, I straight jump crazily to hit him without letting him a chance to bounce around like crazy. I hit him a few frames early by hitting him when I jump on the green platform. The movie could be inproved if more glitches are found, or maybe more shortcuts are found in an odd fashion rather than just airjumping. to CavemanDCJ to his world record RTA (congrats BTW, and YOU!!! for watching! pikachu like wtf is that thing behind me!? Thanks 4 watching and have a nice day! hope you like it. Mothrayas: As a first run of the game, this run is plagued just a bit too much by some sloppiness (which has been noted by some people), mostly regarding jumping - it is possible to cut jumps short by letting go off the directional buttons, which would clearly save time in some areas, with around 2:13 in the YouTube being an obvious example that just looks sloppy with this knowledge. Based on my testing, it is definitely possible to save multiple seconds off the run by doing this. This run just needs another iteration with that extra bit of polish - this version just doesn't cut it, so I will reject it. Regarding the difficulty, the easier difficulty allows more tricks to be used to save time, so it is reasonable to choose the easiest difficulty in this game. Picking the hardest difficulty is not enforced.